Korenix had launched its new product line- JetLink, the Industrial Fieldbus Gateway series. It is divided into two different categories: Modbus gateway and Protocol switch. 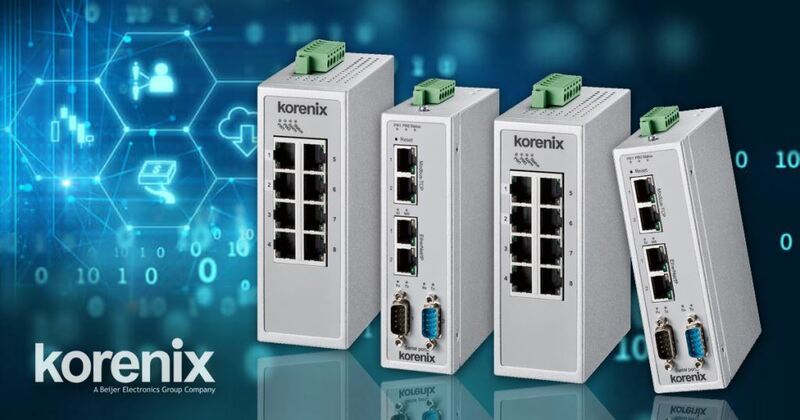 The new product line allows multiple connections and facilitate various Ethernet protocol communications, such as Modbus RTU/TCP and Ethernet /IP. It provides reliable and efficient data converting from devices with different protocols. JetLink 2308/2308M and JetLink 2108 are new generation of entry-level managed switch products. JetLink 2308/ 2308M support media redundancy protocol master and meet the PROFINET real time standard, while JetLink support Ethernet/ IP protocol. The Protocol switches allow fieldbus and Industrial Ethernet, different protocols to communicate with each other seamlessly. They offer reliable protocol extensibility and provide solution for converting data from different devices with different protocol efficiently. It can reduce the cost and complexity of integrating different devices. JetLink 1302 and JetLink 1102 offers fast and reliable protocol solutions between Modbus devices and PROFINET of Ethernet/ IP based systems and PLCs. The devices allow a distributed network architecture that maximizes flexibility and scalability. To collect and exchange data between Modbus RTU/TCP to PROFINET. JetLink 1302 and 1102 are devices that provides simple and cost-effective solution to bring the advantages of fast data transmissions between different devices.